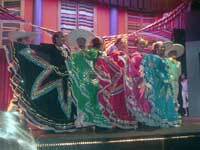 A traditional Mexican Fiesta (Party), where you are met at the door with Tequila and Margaritas by Mexican dancers in traditional dress. Gorge yourself at the traditional Mexican Buffet, engage in the Open Bar, hit Pinatas and get souvenirs, witness the spectacle of Mexican dancing, Rope-throwing Charros, and Mariachi Bands, participate in Contests, watch the traditional entertainment of Cockfighting, and a fireworks show to top it all off. A great time for the whole family to enjoy. Cruise Passengers: This tour makes a great shore excursion if your ship's schedule allows. It might be too late for some cruise ship schedules..
Departs From: NH Krystal Theater, next to the Hotel Krystal in Puerto Vallarta. Directions will be provided with your confirmation. THIS FIESTA IS NO LONGER AVAILABLE. TRY LA IGUANA OR RANCHO PALMA REAL.